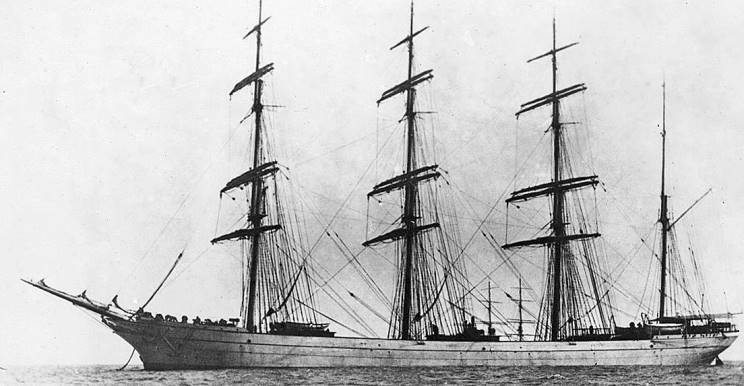 The 2,140 ton four-masted steel barque Cape Wrath was built at Robert Duncan & Company in Port Glasgow, Scotland in 1892. The 280' long ship was built under the supervision of captain Scobie to Lloyd's highest class for the Lyle Shipping Company in Greenock. 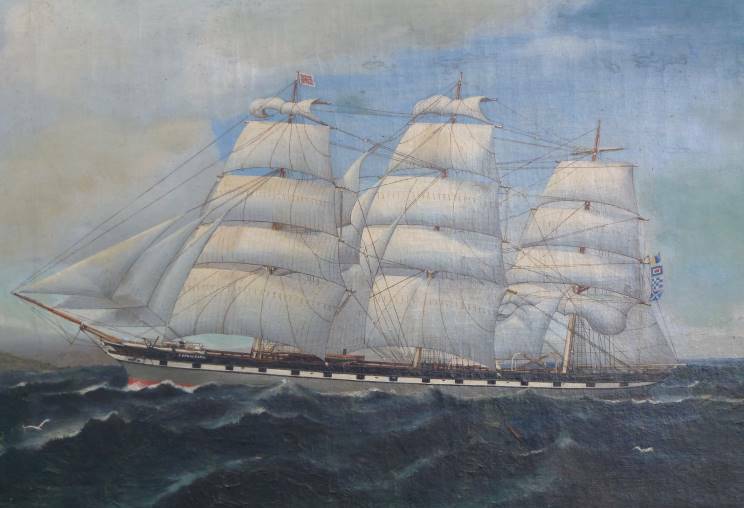 She sailed for them until 1899 when she was sold to the Dominion Ship Company in Liverpool. Unlike today when the news travels fast and we are able to see live images of the Costa Concordia wreck on our televisions, in 1901 getting the news was a little more difficult. 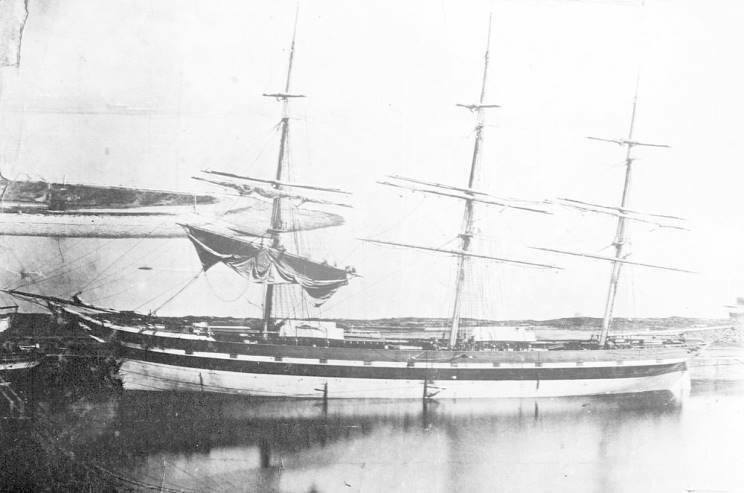 Cape Wrath, under captain Lampshire, departed Callao, Peru on Nov. 2, 1900 bound for Astoria, Washington, U.S.A. There was a report that she was sighted at the mouth of the Columbia River on Jan. 15, 1901, but by daybreak on January 16, 1901 she had gone missing. A storm had blown in behind her and it is thought that this was the cause of her loss, but nobody knows for sure. As late as mid February there were reports that she was overdue as if the report of her being sighted off the Washington-Oregon coast had never been made. I was able to find no other report of her loss, or even that she had been spoken of. What happened to her and the thirty men in her is unknown. What is known is that the Cape Wrath never made port and has not been seen for over 100 years. Thanks for your info on the history of the barque Cape Wrath. My family has some history with this ship as it is reputed that my great, great grandmothers boyfriend was the first mate on the ship when it went down. She ran the Star Inn in Port Soy in Scotland and a fine painting of the ship hung above the fireplace there for some time. This painting (shown above) has been handed down in our family and presently, I am the custodian of the painting. I suppose this is the only visible representation of the boat, but I would be interested if another exists. I have stumbled across your website whilst doing a little research on the Cape Wrath which went down off Oregon in 1901. Prior to this the ship had left Cardiff to go to Mauritius, Australia, Peru then Astoria/Portland ?? I discovered years ago that my great great grandfather was lost at sea. No one including my father and grandfather knew anymore. It then came to light that one of my great aunts had a middle name Zemina. This was supposed to have been the name of the ship that was lost. As of this morning I discovered that the ship was actually called the Cape Wrath. I had trawled the internet for years but got nowhere until this morning's little break through. GG Grandfather was named Henry John Derrick and was born in Somerset. He was about 52 when he went missing. He must have joined the crew at Cardiff. He seems to appear on lists as Hy John Derrick. On the Cape Wrath he is listed as AB. On previous ships he is listed as sail maker. Dr. Jamie Barber has contributed a picture of the ship. I know nothing about ships but it appears to have three masts and not the four of the Cape Wrath. I think one is perhaps obscured at the back! Would you have any further info? Could you possibly pass my email address to Jamie Barber to perhaps compare notes? some name changes after being sold. Thank you so much for this updated information on the Cape Wrath. It is very interesting to see these two photographs. I do indeed agree that the painting I have is probably the first Cape Wrath. The painting has an inscription at the back that says that the first mate's name was Willie Abernathy. He left this painting and a bible to my gg grandmother. The fly leaf of the bible is inscribed with the following ditty, " Remember me when this you see and do my failings all forgive. Twine a wreath around my name and let it in your memory live". This name, Willie Abernathy does not correspond to any that were on the Cape Wrath II, which is another indication that the painting is the first Cape Wrath. "Lest we not forget those who went down to the sea in ships"